What do I really need to buy to get started? I realized my last post was getting a bit long-winded, so here’s my suggested list of what you need to purchase before you get started. If you opt for prefold diapers, then you also need covers. Prefolds & fitteds aren’t waterproof on their own, so a cover is a necessity. If you opt for pocket diapers or all-in-twos, make sure they either come with inserts or that you have some for your diaper shells. The shell isn’t absorbent on its own. That’s it! Diapers! Not too complicated there. Now I don’t call any of the below accessories true necessities, because you can get by without them. (I have customers that just use old shopping bags for their dirty diapers when they’re out of the house, or they use old trash bags for their dirty diapers at home.) But all of these are nice things to have. They also make great gifts for people, if you know someone who is going to be cloth diapering. Often the accessories get a bit overlooked, but they do make life easier. How can I start cloth diapering without breaking the bank? First–and I know this sounds simplistic–but try not to focus on everything you’ll need from birth to potty training. Start small. I meet many people that get discouraged at the cost of diaper sprayers, bigger sizes, etc… but you don’t go out and buy a year’s worth of disposable diapers at once, right??? If you did, you’d be discouraged with disposables, too! Don’t get too far ahead of yourself. Hold off on the purchases you won’t need until later, and start with an essential stash. There are a couple of ways you can start cloth diapering. Some people are successful with just buying one or two diapers per paycheck and just cycling those in with their disposable diapers, and slowly building up their stash that way. This is great for those who are very patient–but it can also lead to discouragement for others. Trying to use both disposables and just a couple cloth diapers can get very frustrating. For one thing, you still have all the hassles and expense of disposables, and then you don’t have enough of a stash of cloth to really “get going” and develop a routine. And, since you are only using one or two cloth diapers a day, it can start to feel like the change to cloth isn’t making a difference, either budget-wise, environmentally, or for your baby. Now I know some of you are thinking, but aren’t prefolds hard??? And the answer is, not really. Sure, I admit they aren’t quite as convenient as pocket diapers and some of the fancier modern diapers, but they are still very workable. I think a lot is just in the frame of mind people go into diapering. 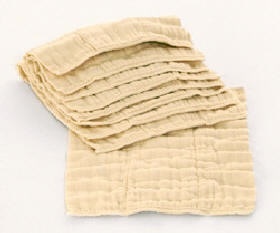 The moms I’ve met that are really committed to diapering in the most economical fashion always seem to manage with prefolds, and then the ones that are sort of set against it going in often find reasons that confirm to them that prefolds aren’t for them. So, maybe prefolds won’t be your choice…but they are the cheapest way to get into cloth. If you decide that prefolds aren’t an option, there are some ways to diaper cheaply. First, check your local Craigslist or mom’s groups and see if anyone is willing to loan or sell their diapers. Often people want to get rid of their older items, and cloth diapering moms are sort of a “community”–a lot of times people will give killer deals just because we like to see other moms succeed at cloth diapering, too! There are also some online resources. Diaperswappers is the premiere place for buying and selling cloth diapers. (Note: I have not had good success on ebay. First, used diapers are technically prohibited from being sold there, and often the new diapers are no cheaper than buying from a store, but without warranties or any protections that you get from buying from someone reputable.) On Diaperswappers, you can often find diapers in good used condition for around 50-75% of their new cost. Also, keep in mind that all of Mothering Grace’s Busy Moms’ Bundles are discounted, and remember that we do price matching, free shipping, and we have a very liberal return policy, too! Most of all, though, I encourage you to take advantage of resources around you before you set course on a diapering system. While what works for your friend may not work for you, it is nice to get some opinions from people you know. And I am always so disappointed that more people don’t contact me and really ply me with questions about diapering. My favorite part of owning a diapering business, the reason why I got into this, is because it is a joy to help people make the diapering choices that will really work for their families, budget, and lifestyle. Please take advantage of this if you are considering cloth and chat with me! I feel confident that there are solutions that make sense for everyone, no matter the budget constraints. 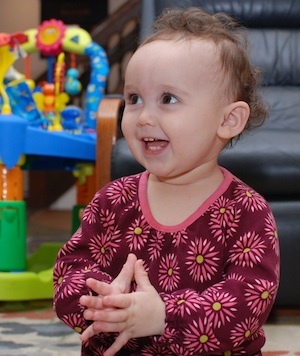 question: My child is nearing toddlerhood. Can I still benefit from switching to cloth? I am approached by a lot of parents who fear that, since their child isn’t a newborn and is maybe close to their first birthday or even past it, that they have missed their opportunity to use cloth diapers. Not so! It’s never too late to consider a switch to cloth, and never too late to start reaping the benefits of cloth diapering. First, the health benefits of cloth are going to benefit your child no matter when you switch. By switching to cloth, you’ll be reducing your baby’s exposure to harmful chemicals like dioxin that are found in disposables. Also (and this may excite you), cloth-diapered babies generally potty-train up to 6 months earlier than disposable-diapered babies, so you may be making life easier for both you and your baby by making the switch. Second, you can still benefit financially, too. 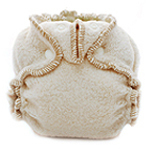 The initial investment is what scares many people off from cloth diapering. But consider this, most babies are in diapers for 30 months, and most families spend at least $50 a month on disposables. If you switched your child at a year, you are still most likely looking at 18 months of diapering, or around $900 of potential disposable diaper costs. We have many systems (in fact, all of our predesigned systems) that cost MUCH less than this, even with the “fancy” diapers like pockets or AI2s. This savings doesn’t even begin to include the fact that, even after your current baby is done using the diapers, they are still usable for any future children you might be hoping for, or you can sell the diapers when you’re done. Used diapers sell on average for around 50% of their initial retail value, if you are willing to sell on Craigslist or Diaperswappers. And it doesn’t have to be all or nothing… I have one friend who started cloth diapering her children literally a diaper at a time, until gradually her budget and time allowed her to build a complete stash. She is now cloth-diapering full time, but she made the transition without breaking the bank. Also, you may find that you have more options in diapering types if you are past the newborn stage. Often the one-size diapers will fit toddlers perfectly until potty-training, or if you opt for a sized diaper, many kids never grow past the size mediums. You may be able to buy one size and never even need to size up, since toddlers’ bodies often “lean out” as they are more active than the crawlers. I know with my Grace, she has been in the size mediums for over a year and still has room, and she is a big girl too at 25 lbs. at 17 months. Starting cloth when your child is older may be the perfect time for you and your family. You are probably more settled into parenthood (or in some cases have adjusted to adding more children to your family) and perhaps more mentally ready to tackle a new diapering venture, now that all the initial changes of bringing a baby home from the hospital have wound down a bit. If you are interested in starting with cloth, I do recommend trying to find some support and checking out the diapers yourself in person if possible. Often the selection online seems overwhelming, and it’s difficult to grasp the differences between each diaper if you can’t see them for yourself. At the very least, even if you don’t have local cloth diapering resources, feel free to contact us with any questions. My favorite part of owning a cloth diaper store is helping parents make the transition to cloth and introducing them to all the varieties that are available.